New Earrings and the Advent calendar is up! I know I know. I've been gone a LONG time. Well I'm back. We will keep this short and sweet. New earrings! Also the advent calendar is up! I'll keep a weeks worth of items available at a time in case you miss a day! It's the holiday season again. In the spirit of giving I'm going to do a daily give away at my main store. Swing by and steal my stocking hanging on the fireplace. Each day there will be a new custom goody in it! Happy Holidays to everyone. Thats right... rl has been kicking me in the tuckus... A real life move, trying to redesign my store, vacations, and back to school for my kids has had me soo busy i've not even posted about my new stuff! (there is a lot of it!) Head by my Main location to see all the new fun stuff... Also SALE!! Random stuff throughout the store is on sale and I have a Treasure hunt!! 9 different boxes with great freebie (most straight from my main collection) are scattered throughout the store. Also I've a new designer showcase in a small shop right at the entrance. Minau Singh ( I know I've spelled it wrong so sorry Min!) Has a selection from her new store Saint Sinners out and for sale. She makes cute bikinis, with Matching Minis or silks :) Go by And check it out!! Hello! I know I've been out of touch for a bit.. and not released much of anything (okay okay I've not released a damn thing). But I'm back.. and I have these for you.. I'll keep this short and sweet. 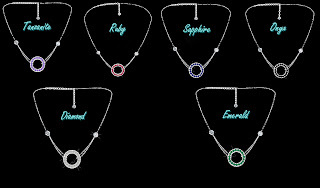 These lovely eternity necklaces are availible at my Main store, pierwater store, Angel Square, and my Port Luskan locations. It's 1250 linden for the fat pack whick includes the tanzanite, ruby, sapphire, onyx, diamond, and emerald versions, and 250 for the singles. Enjoy! Well back from vacation.. I'm tried, sore, and sunburned... but I couldn't let Patties day slip by without something to celebrate... So here ya go new earrings.. And untill tomorrow they are 10L$ after that they will go up to 100L$ Enjoy. These are at the main store and the Pierwater location. New store location = SALE! That is right! I've opened my 4th location. My friend Bailey Longcloth offered me shop space near my favorite hang out in Secondlife, The Crown and Pearl. I of course jumped at the chance. I love a good distraction and what is more distracting than going to work at one of your shops.. and being right next to your favorite pub?? So anywho. My 4th shop is now open. It has a collection of my newest and best loved pieces.. all at 50% off for the next week. That is right, I said 50% off! So at my Angel Square location you will find a good selection of my best pieces at bargain prices for a limited time. While you are there check out the other shops, and pop over to the Crown and Pearl and say hello. The people are great, the music is good, and I promise you will have a wonderful time! Well last week week was very busy for me. I made a bunch of new stuff including this set. I named it the "Stone Hinge" set, mostly because the Evil Sister came in a said "Ooo look at all the pretty stones! Is that a hinge in the back?? YOU should call it Stone Hinge!" . I couldn't seem to get the name out of my head so of course it stuck. The necklace mirrors the bracelet in style, it is however quite different. All the pieces feature lots of gemstones such as labadorite, amber, opal, turquoise, lapis, malachite, and jade. Each bead is scattered across the rings of silver that make up this playful necklace. The earrings in this set are long arches of silver with a single gemstone suspended from the end. The triangle that holds all the seperate arches really highlights the art deco inspired look of all the pieces. Each earring is slightly different to really give this set that artistic feel. Lore states that when a dragon cries, that it's tears turn to glittering gems that range all the colours of the rainbow. This was the first of the necklaces. It has an array of purple and pink gemstones that are graduated in colour from a bright pink in the center, to almost black at the outer edge. Each stone ,set in a swirl of silver, is multi layered and faceted for incredible depth and realism. With stone ranging from pink tourmaline, amethyst(in several shades), and plum topaz(in several shades). This necklace will dress up any outfit. Second verse same as the first! Only in citrines and topazes of many colours. And now for the stand alone pieces. Simple elegance, that is the look I was going for in this bracelet. The silver and gold bracelet is a classic that will go with every thing from jeans and a cute top, to an elegant evening gown. With saint Patrick's day being right around the corner.. I decided to make a necklace to help celebrate this fun holiday. In my real life my hobbies include a historical recreation group called the SCA. The household (if you play a lot of mmorphs think guild) I play with has four leave clovers as their symbol so this piece is quickly becoming something I wear a lot. I hope you have as much fun with it as I do. Amethyst and Silver.. I love the two together. I was wearing the Dragon Tears in Purple Rain necklace and needed matching earrings so I re textured this pair to do the job. They came out so lovely I decided to offer them to you. I hope you like them as much as I do! Hi, I'm Ashlinn McMillan, and this is Fae Designs. I've been in world for a year now, and have always strived to keep appearances, such as my shape, as realistic as possible. That's when I ran into an issue with jewelry in world. It was either way over the top, or outside of the price I wanted to spend. I'd toyed around with building before, so I set out to create my own jewelry. It all started with a simple ring for my partner, and from there it spiraled almost out of control to become an obsession. I now have three locations in world, (Main store)and an On-Rez web store as well. 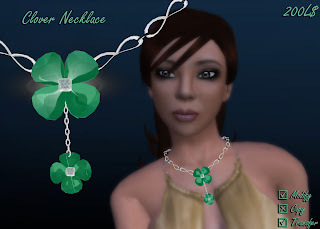 With a growing and diverse catalog, you will find anything from simple, inexpensive pieces, to beautiful, realistic items you won't find the likes of anywhere else in Second Life. If you can't find just what you need, I'll also custom create an item for you. So, to keep informed, on what I've been working on, keep an eye on this site! I get a lot of of comments about my advertisement pictures. Yes I know. They rock. They also happen to be the work of my partner Alfrik Northmead. He's a photographer for his real life occupation and applies all that wonderful knowledge and skill to making my adverts look the best they possibly can.